Of course we have a modern gymnasium that’s well equipped to suit all levels. We have the main hall for Badminton, Basketball, 5-A-Side Football and various Aerobic and Pilates activities, but we offer something else that sets us apart from other local leisure centres. At Birchwood Leisure Centre we take an interest in our Members. Our members are our Customers and know how important it is for you receive the right level of attention and service. We care about you. It doesn’t matter what size, shape weight or age you are if you have goals we are here to help you. If you just want to come along and use the facilities or join a class you’re welcome. We are not judgemental and everyone is treated with the same respect. This interest in our customers has allowed us to learn more about you and introduce additional facilities to serve the local community and local businesses with private rooms available for conferences and meetings. More Details can be found from the various links shown on this page but a brief introduction is listed below. Hatfield Kids FunZoneis a soft play centre with a designated Toddlers area that can be booked for private kids parties for which you may self-cater. Birchwood Leisure Centre has a dedicated Pilates Studio is for all ages and all levels. New Mummies to Grand-Parents can enjoy low-impact exercises and may even benefit more from the new Tai Chi (Chi-Kung) meditation in motion to help you align your body your mental thought process. Check this out Pilates Studio The latest addition to our sporting activities is Senior Walking Football. Apparently this is the fastest growing activity in the UK for the over 50’s. 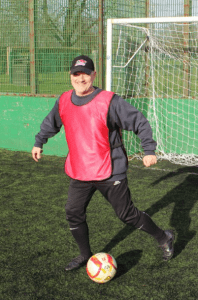 Walking football sessions have been a phenomenal success with all gender turn up and play. Enjoy trying to recover all your old skills and learn new ones in the company of like-minded people having competitive fun. Although over 50’s, most of our players are over 60 and our oldest is nearly 80 and is still scoring goals. This is played on our artificial 3G football pitch or inside when the weather is inclement. We have three full-size grass football pitches and one junior pitch for hire, plus a 3G all-weather football pitch for matches and practice sessions. After or before any activity you decide upon you can meet or relax in the Moon Coffee Shop for a range of hot and cold drinks and snacks, including; coffees, teas, hot chocolate, slush puppies, soft drinks, sandwiches, wraps, and paninis. You will be made more than welcome. If you need more information or details on any specific activity, check out our brochure using this link or contact us from the following contact details. Here at Birchwood Leisure Centre, we offer a range of Gym Memberships to suit your needs. Our gym is open 7 days a week between 9am and 10pm. You can join at any time during the month, and your payment can be made monthly or annually. Birchwood Pilates have two dedicated Pilates Studios, one studio is equipped with 7 reformers and small equipment, the other studio has a cadillac, spine corrector and Pilates chair ideal for rehabilitation or private lessons. We provide excellent tuition by qualified and experienced teachers in small, friendly classes. Hatfield Kids FunZone is a multi-level indoor Soft Play Centre with designated toddler area. There are a variety of slides, ladders and swings to entertain your children. We offer self-cater Exclusive Use Children’s Parties, weekends and evenings for up to 40 children 16 years and under, and casual daytime use: Monday to Friday, 9.30am till 4pm. Our Coffee Shop is open seven days a week, from 9am until late, and sells a range of hot and cold drinks and snacks, including; coffees, teas, hot chocolate, slush puppies, soft drinks, sandwiches, wraps, and paninis. We have a multi-functional hall used for badminton, aerobics, basketball, five-a-side football and netball, and two meeting rooms available for hire. You will find more information including prices using this link.